American Spun is a collection of 20 timeless patterns, as well as an introduction to American Yarn and the people who produce it. 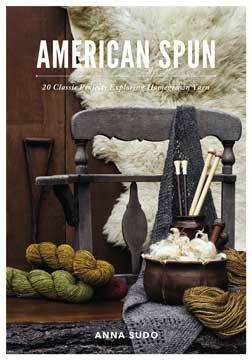 Filled with gorgeous photography, classic projects, and a directory of the most exciting yarn producers working in America today, American Spun makes a handsome addition to the hobby knitter’s bookshelf. Anna Sudo is a graduate of the Kansas City Art Institute. After spending a decade in Japan, she returned to the Midwest and rediscovered American yarns. She found that showcasing the producers and quality of these yarns in her original designs was an intuitive way to reconnect with her own roots. She is currently based in Kansas City, MO.